Great weekend for us all! On Sunday we had an International Kennel Club Show. Eija Halonen did the Standard Poodlles this day. Simon was BOB and this day Klara got BOS!!! Berta was 2nd! In this way they all got happy! Simon also ended up BIS at the Swedish Kennel Club Show! So what more could we ask for?? I remember when I showed Max, Ch. Huffish On Every Street 2006. 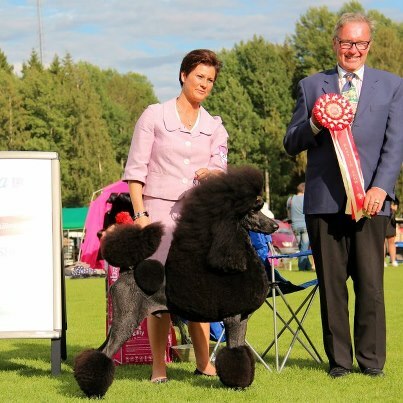 We had the same kind of weekend in Borås were we had the Kennelclub on Saturday and he won the group, so he had to come back for BIS on the Sunday, on Sunday we also had the Poodle Club Show. Max was BIS at the Poodle Club show and we had to run straight in to the BIS final ring at the Kennel Club Show and he won that as well!!! 2 BIS on the same day!!!! ← William follows the father with the passion for machines….